As a parent, you always want the best for your child. Since your child will spend a significant amount of time at day care, it’s easy to understand why parents put so much effort into researching before making their decision. If you’re in the process of looking for a day care near me but are feeling lost, don’t get discouraged! This single factor is the fastest way to narrow down your possible choices. If a day care doesn’t have a glowing reputation, there’s simply no reason to give it another thought. In addition to researching local reputation, you can look into whether or not a day care has multiple locations around the country. Multiple locations are generally a very strong sign that a day care has worked hard to build an exceptional reputation. While some flexibility for a day care center is important, you also want a center to have clearly established regulations for everything from operating hours to how to handle emergencies. Any quality center should be able to supply you with a written copy of its policies. Whether it’s 2 year old curriculum for daycare or an older age, the best daycare centers have structured schedules that include plenty of time for lots of playing, physical activity, quiet time, group programs, individual activities, meals and snacks. This type of curriculum ensures kids are well-rounded and that their days provide exactly what they need during that stage of development. A great day care is going to consist of teaching staff who are committed to the highest quality of child care and development needs of every child. These professionals choose working with children as a life choice, not just a job. A reputable center will require all staff members to pass rigorous background checks and provide ongoing guidance from a skilled management team. From infant day care near me to older ages, the right choice is going to be clean and sanitary. In fact, you shouldn’t simply settle for that baseline. The best facilities are actually constructed with the environment in mind. Not only is a green day care great for the environment, but features like ductless rooms help prevent the spread of germs. 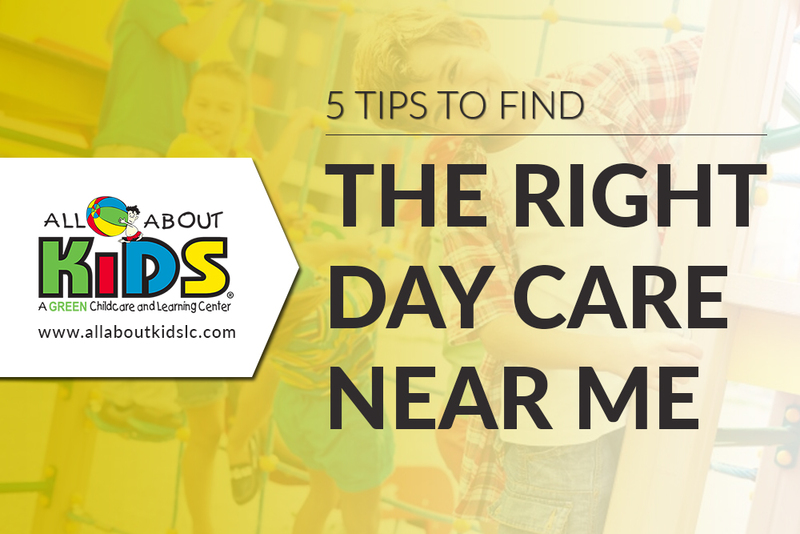 If you want to discuss more about day care options in person, we encourage you to schedule a tour of your local All About Kids location.